Buying a new home is an exciting experience, especially when the home and family is kept safe and sound. Once the house is purchased, it's wise to invest a bit of money in preparation of emergencies. Not all homes will be up to date on safety equipment. There is always a possibility that some items, such as smoke detectors or fire extinguishers, are nonexistent or expired. Modern smoke detectors tend to have a better sensitivity to smoke and additional features, such as the ability to notify those who aren't home or to alert residents with bright flashing lights. All devices should be tested to ensure that they work and that the batteries are not faulty. Every kitchen should contain a fire extinguisher, as one never knows when the kitchen might go up in flames due to a cooking mishap or appliance malfunction. In addition, homeowners might entertain the idea of small scale kitchen fire hose equipment if they have a large kitchen. 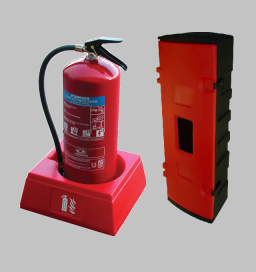 This is a great backup plan in case a fire extinguisher is not able to put the fire out completely. Outdoor floodlights, especially motion detecting lights, help the family to spot trespassers in the yard. Both humans and animals can be dangerous, whether it is a thief looking to break in or a wild bear looking for a trash can. Motion detecting lights tend to scare off people with ill intents, as they do not want to be seen. This is a cheap, useful safety feature every family needs to have. If the electricity ever goes out due to weather or natural disaster, generators can save the day. Generators run on fuel and can power a house for a few hours or a few days. This can help the family to keep warm, cook food, and calmly wait until the power outage is over. Corded landline phones are capable of being used during power outages. Wireless phones require electricity, proving them to be useless during an emergency situation. Even with cell phones nearly causing land lines to go extinct, all homes should have a basic landline service should the cell phones lose service or die. Safety and peace of mind is always a great investment when buying a home. Many situations can quickly escalate into emergencies, from fires and other natural disasters to overloaded power grids and criminals. For under a thousand dollars, all families can be prepared for some of the most common emergencies that occur.